Lat week I told you about my Australian bush hat’s baptism of fire when I spent four hours cruising in torrential rain. I received a few suggested remedies. One of them (from my father in Australia) was to send the send the kangaroo skin hat adorned with crocodile heat back to the supplier and get a crocodile skin hat decorated with kangaroo teeth which, my father assured me, should offer far more effective rain protection. Much as I like the idea of a crocodile skin hat, I’ve settled for a more workable solution and ordered some good quality dubbin to rub into the hat. Unfortunately the application process involves heating both the hat and the dubbin with a hairdryer so I need to persuade Sally to lend me her monster. I’m sure she hires it out sometimes to film producers to use for wind effects. Over the next couple of days I’ll make sure that it’s thoroughly covered with the mixture of wax, oil and tallow and then wait for some heavy rain so that I can try it out. I don’t think I’ll have to wait for long. The weather has taken a turn for the worse. After months of beautiful summer days under cloudless skies, I’ve been regularly running for cover this week to escape heavy showers. Running for covers has often been difficult because I’ve spent much of my time chest deep in the marina. The reeds are a nightmare at the moment. There’s nearly a mile of them to cut; 0.96 miles to be precise. I’ve just measured the circumference of the marina with the measuring tool on Google Maps. The circumference of Meadows marina is 0.48 miles and we need to cut back both the side facing the water and the side facing the bank. The reeds, which we were assured wouldn’t spread when a two feet thick band were planted around the marina edge in 2006, are now a jungle fifteen feet wide in places. They’re encroaching on the marina’s grassed earthen retaining wall and are spreading out onto the moorings themselves. We aren’t allowed to cut the reeds between the the beginning of February and mid May because of nesting birds but it’s open season on them now. Cutting the reeds on the bank side isn’t too painful a job. It’s painful enough, but it’s manageable. At this time of the year when the ground is hard, we can drive our Nissan Cabstar truck up onto the bank, use one of our strimmers with a circular saw blade attachment to cut the reeds and load the cuttings straight into the truck and then take them to our tip area where they will be burned. It’s the water side which is proving a problem. We’ve tried casting a grappling hook from the bank to try to snag them and pull them out but the grappling hook can’t grip the slender stems. We’ve tried leaning over the back of the cruiser stern of one of our hire boats but we can’t get low enough to the water. We’ve tried doing the same from a small flat bottomed skiff but we’ve nearly overturned the thing. We’ve tried wading into the water to pull them out but Pat, who is built like a rather large silver back gorilla which has spent far too long in his jungle gym, has nearly put his back out trying to pull the deep rooted reeds out of the stones lining the marina. The only option open to us at the moment is to climb chest deep into the marina wearing our only pair of chest waders armed with a pair of 12″ garden shears and cut them off level with the water. It’s not a very good solution given that (A) the shears are blunt, (B) there’s nearly half a mile of them to cut, (C) they extend out into the marina into water too deep for the waders and most importantly (D) the waders have now been punctured in half a dozen places by razor sharp cut reed stems. It’s a right royal pain but there are worse jobs to do around the site. Sewage pipe unblocking is one of them. Unfortunately for Pat, he was the first one to see a blocked sewer this week. We process all of our own sewage on site. All of the human waste from the pump out and Elsan points in the wharf and in the marina, the toilets in the office, the cottage, the wharf toilet block and the toilets in the shower block flow down to our reed bed filtration system where the solids are retained in a tank for collection and the liquids pass through a reed bed for purification before entering drainage ditches. There are 350 metres of fairly narrow pipes to carry the waste. Unfortunately they are only a little larger than the caps of toilet cassettes which boat owners feel the need to drop down the Elsan points several times a year. Fortunately for Pat, ten minutes with a forty feet length of blockage busting rods was enough to dislodge a thick wad of flow stopping toilet paper. The rod pushing endurance record was set by me last year when I spent seven hours knee deep in the brown stuff when a cassette cap jammed seventy metres from the nearest manhole in our tip area. It wasn’t my most pleasant day at work. While Pat was busy with elbow length rubber gloves and reeking rubber rods, I was busy slug slicing. We’ve had plenty of heavy showers this week followed by bright sunny spells. It’s perfect weather to bring out the slugs in droves. In places the grass was alive with masses of writhing 6″ long black custard filled crawlers. In a perfect world I suppose I should have either postponed my grass cutting until the slugs retired for the day, or scooped them up by the bucketful to carry them to the safety of the verges. But we don’t live in a perfect world, I don’t like slugs and I didn’t have time to move them so I mowed them instead. Cutting them to shreds didn’t bother me too much but cleaning off the body parts from the mower’s three blades at the end of the day wasn’t too pleasant. We took the boat out for the day on Friday, just so that we could play at being proper boaters. We didn’t go far. Even though we moor in a wonderful location on the network with a wide variety of routes available to us, two out of the three canals within a day’s travel have a dozen locks within an hour’s cruise so they aren’t really practical for a day out. We made our way around the frequent twists and turns heading towards Braunston, turned the boat around at the winding hole in the middle of the garden moorings at Wolfhampcote and headed back towards Calcutt. We stopped for an hour to sit in the sun, then cruised for another hour while Sally made dinner with an ever changing view from her kitchen window. We moored again for long enough to enjoy a leisurely meal while we watched the rain clouds march towards us then made our way back to Calcutt. We decided to stay above the top lock on Friday night so that we could make a quick escape after I finished my normal day’s work on Saturday and after Sally had finished some last minute overtime. We didn’t quite beat the rain. We moored in a torrential downpour in the only space available which meant trying to secure pins in a crumbling bank hoping to secure the boat against the stiff breeze which was trying to push us into the middle of the canal. After half a dozen attempts I found some firm ground. At least I thought it was firm ground until the following day. I ran from the wharf back to the boat to find that the pin holding the bow had pulled from the crumbling bank in the freshening breeze allowing the boat to swing out into the canal blocking it in both directions. How embarrassing! A couple of passing boaters had pulled over and were busy pulling the boat back in when I arrived. They left me to finish the job with a cheery wave. I pulled the boat back into a recently vacated space next to firm ground. We’re still there now. I didn’t say goodbye to the last holiday hirer until 6pm yesterday so wasn’t in the mood to cruise for a couple of hours in a strong breeze. Neither of us minded staying put. It’s a wonderful location to just chill out and do a bit of people watching. The couple moored on the opposite bank have five dogs. The dogs were quiet last night but they also have a large and very vocal pet crow in a wardrobe sized cage beside the boat. Other than that we enjoyed a tranquil night on the towpath. It’s wonderful living afloat. Popular misconception number one; a narrowboat is like an ice box when the temperature drops. “I bet your boat is cold in winter!” the gongoozlers cry. I answered this one last week so I won’t go into it again. Here’s last week’s newsletter, here’s a post I wrote about living on board during the colder months and here’s a post from last year when I tested a number of different stove fuels. There you go, no more cold winters or winter boat problems. Popular misconception number two; I don’t need a mooring. I can save several thousand pound every year by moving to a new location every two weeks. The only way you can do this is by moving as part of a genuine cruise from points A to B to C to D to E. What you aren’t allowed to do is to move from points A to B to A to B to A. It’ called bridge hopping and the boat owners who do it are often referred to as continuous moorers. Continuous moorers or what CRT call non compliant continuous cruisers, are an increasing problem on the waterways, especially in the south. The lower section of the Grand Union, large stretches of the Kennet and Avon and just about anywhere on the canals around London have become extremely congested. I’ve been told, although I haven’t been able to verify the fact, that the number of residential boaters in London has increased by 60% in the last year. Many do not have official moorings. I emailed CRT at the beginning of May to ask about the current status of residential moorings and the Trust’s view on the recent increase in boat owners wanting to live afloat. Here’s the reply I received. Are you free of fixed obligations, such as education, employment or healthcare, in any one area? Can you commit to moving to a new place every 14 days? If you answered no to either question something in your circumstances would have to change for you to become a footloose, rule-following continuous cruiser. We’ve recently started contacting all newly registered continuous cruisers welcoming them to the waterways and providing them with information about the requirements they need to fulfil, and the action we’ll take if they don’t. I’ve attached the related press release, which I think you’ll find helpful. We want people to be aware of the cruising requirements so they don’t run into trouble later on. The Canal & River Trust is reminding people taking up a new liveaboard lifestyle on its canals, but without a home mooring, to think carefully about the demands of living afloat through a series of awareness-raising measures. In some popular areas, this style of living is on the increase and the Trust is concerned that the newcomers may not be aware of or fully understand the requirement for bona fide navigation and may believe it is sufficient simply to move around within a small area. Some therefore get a shock when they find that they are in breach of the rules, while the Trust is forced to embark on a time-consuming and costly enforcement process. The Trust is working to raise awareness of these constraints amongst home-seekers and boat sales advertisers. It is also aiming to provide clearer information to the floating community so, from January 2014, will be contacting everyone newly registering as a continuous cruiser to ensure they fully understand the requirements. After three months, if there is concern about a boat’s limited movement, the charity will send a reminder and invitation to contact the local enforcement officer to discuss the cruising pattern. Ultimately if they can’t meet the movement requirements they will need to get a home mooring before their licence can be renewed. I receive emails almost daily asking me about the availability of moorings, especially in the south. The fact is that official residential moorings are hard to find so unless you are free of ties to a geographical area or unless you are prepared to invest in a considerable amount of time looking for a suitable mooring you need to think very carefully about the viability of living afloat. 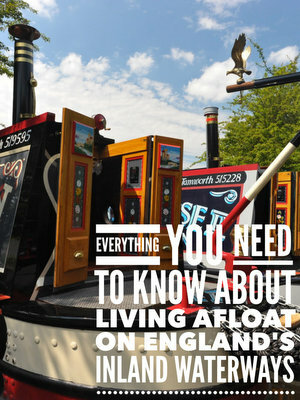 Popular misconception number three; narrowboats are cheap to live on. It’s true. There are boat owners who exist on very little but they tend to do just that, exist, rather than living in comfort. A couple of years ago, a common site at Calcutt was a single middle aged guy named Paul and his affectionate bull terrier. Paul lived on a run down GRP cruiser. The benefits he received from the government funded his lifestyle but it was a lifestyle which was a long way from being comfortable.. Although he wasn’t quite as uncomfortable as those sleeping rough on the streets, he wasn’t far removed. Paul liked to move from place to place but he couldn’t afford fuel for his outboard engine so he pulled his boat along the towpath with a piece of string as he couldn’t afford any rope. I didn’t establish whether he had any cooking facilities on board, and I don’t think he had heating either. He certainly didn’t have a license for the boat, didn’t have a home mooring to pay for, and didn’t have to fork out for expensive engine maintenance given that he didn’t use his engine. It was a very low cost lifestyle, but it wasn’t a lifestyle which would suit me. Of course Paul was at the far end of the scale but there are a fair few live aboard boaters who aren’t far removed from Paul’s situation. Roughly 4% of all boats on the network are unlicensed. Given that there are 34,000 boats registered on the inland waterways network, that means that over 1,300 are unlicensed. But many of the licensed boats are in a bit of a state too. I get to know quite a few live aboard boaters and a little about their personal circumstances. Many spend a honeymoon period, sometimes lasting a year or more, when they live a very comfortable lifestyle courtesy of what remains of their savings after they’ve bought their boat. Once the initial period of easy living is over though, they have to rely on income which doesn’t always allow them to maintain the boat and live the way they would like. At the moment it’s not too difficult to get away without having an expensive mooring, or even a mooring at all. It’s possible to avoid the waterways enforcement team for a while and a boat will last for a number of years without any maintenance at all. Eventually though. paint will flake, bare steel will rust and pressure from the authorities will mount to pay the required fees. The once idyllic lifestyle will become just as painful as it was on dry land. It’s best to know the full costs involved before you sell your bricks and mortar and buy a boat to live on. I’m frequently told that the very best place to find out the true cost of living afloat is here on the site. The package is the result of years of writing and research. There’s over 500 pages of information, in PDF and Kindle format and a user friendly and very flexible browser based budget calculator for you to play around with and establish how much your new lifestyle is going to cost. If you’re seriously considering living afloat and don’t know the costs involved you can instantly have all the information you need at your fingertips for less than the cost of a pub meal. Put two or more boaters in the same room and sooner or later the subject of toilets will come up. They’ll discuss waste tank capacity, pump out costs, toilet designs and problems, and they’ll do it with a degree of enthusiasm which you might not expect. Toilets and their contents is something which boat owners need to get much closer to than those living with the luxury of mains drainage. As a boater, I’m quite used to discussing the topic length. As an instructor for Calcutt Boats I have to discuss toilets briefly and very delicately with our holiday hirers. I normally see the first grimace of distaste from the adults, and sniggers from the children, when I say “dump through toilet”. Most hirers dislike the subject but manage to get through the two minute toilet tuition without any problem. Most, but not all. Last week we had to explain the ins and outs of on board waste disposal with a very sensitive lady. Her first sight of the dump through toilet was enough to start her retching. By the time we had explained how to tell if the waste tank is full (You press the flush pedal to open the flap at the bottom of the toilet bowl so that you can see the level of waste in the tank beneath), she was leaning over the side of the boat examining her morning’s breakfast. Most people don’t find the topic that distressing but it’s a subject you need to be familiar with when you own a floating home. I’ve written a post here about narrowboat toilets here. I made the mistake of stating that there are two types of narrowboat toilet. Of course there are three types. I didn’t mention the composting toilet but several people have added comprehensive comments about composting toilets. Modified or pure sine wave inverter supplying 220-240V AC 50Hz, drawing power from a bank of batteries. The available current is limited by the size of the inverter and capacity of the batteries. Some equipment and appliances do not take kindly to modified sine wave, so there can be a problem. On board generator supplying 220-240V AC 50Hz to power appliances and other equipment, and possibly also charge batteries when needed. Some generators are fitted with a starter motor and battery and also have a 12V DC output specifically for charging external batteries. What about a fairly powerful generator connected directly to the main engine. This could provide maybe up to 10kVA of sinewave 220-240V AC 50Hz, sufficient to power almost anything you care to imagine (fridge, freezer, washing machine, coffee maker, electric kettle, lights, heaters – the list is endless). For a continuous cruiser this would seen the ideal, while cruising along spare engine capacity could be put to good use making life on board as convenient as living in a house, but with the added advantage of the freedom of cruising. I don’t know much about diesel engines but I remember reading somewhere that they “prefer” to be loaded, running on light load causes them to coke up. The one problem I see is the need for a stable sinewave frequency of 50Hz, this is controlled by the engine rpm, so needs to be stable. For a single phase generator this usually means a shaft speed of 3,000 rpm (divide that by 60 to get revs per second and this magically gives a result of 50). The only way I know to maintain a steady engine speed and still control the boat speed is to use a variable pitch propeller and use a governor system on the engine – are these available for narrowboats? An engine mounted generator is available from Beta Marine. I understand that the downside of the Travel Power system is that it’s difficult to retro fit because of the pulley configuration and that the maximum stated power is only available when the engine is running at between 1500 and 2000rpm or, in my case, at maximum inland waterways cruising speed. Other than that, I’m afraid I don’t know much about the system. However, there are a few technical types on the forum who will be able to provide you with all the information you need on the subject. I’ve been inviting narrowboat enthusiasts on board my own live aboard narrowboat now for the last two months as part of a new service I offer on the site. The day is a mix of helmsmanship, a day long discussion on the pros and cons of different narrowboat styles, sizes and types of equipment, a walk through of my own boat and an explanation of how everything works (or doesn’t in some cases) and a cruise through the beautiful Warwickshire countryside. Last week I took Justin Parish out for the day. Justin is ex military, so he’s had the pleasure of living all over the world. He’s used to packing light and constantly moving, living close to nature and meeting new people. Justin is a seasoned narrowboat hirer so he didn’t need any basic helmsmanship training. His goal for the day was to learn how to handle a narrowboat single handed and to decide one way or the other whether living a life exploring the canal network is the right move to make. Thanks again for a great day, good to have a laugh when we could and certainly your company kept me cheerful. Sorry to read that you ultra snazy croc hat was a bit of a flop! You can buy waterproofing spray for them by the way. Will let you know how I get on with boating. I guess I should sign up for he site. The pre info for the day was great. The directions were very good. I followed them and had no issues finding my way directly to your boat. Just looked over them again and cant see anything missing really. I thought the day was splendid. As you know I am planning to buy a canal boat and live on board cruising permanently. Although I have plenty of holidaying on boats experience I had gaps in knowledge and was particularly after information/tips on buying a boat and preferred specs, some explanations on technical aspects and to gain some experience with solo boating. I thought you covered everything I was after. The walk round your boat explaining systems and talking about relative merits of different types of heating etc was great and will help me greatly with buying a boat. I enjoyed the cruise and was grateful to learn how to solo lock with someone about to help or fish me out of the canal if needed. The way you get information across is very good with your knowledge, patience and enthusiasm for the subject always coming through. I can not think of anything else I needed on the day. I think the merit of your day is that it covers pretty much everything with enough time to still be tailored to the needs of those who attend. If anyone is thinking of canal boating and has any doubts in their mind about any aspect then the day is well worthwhile. I’m sure novices and veterans could all learn something and you were great company throughout. Thanks again Paul for a great day. I enjoyed myself and learned lots, which I know will give me the confidence to make my dream happen. I try very hard to make the day as informative and as pleasant as possible. It’s great to receive feedback which indicates that I’m on the right track. If you’re seriously considering living afloat I urge you to consider attending a discovery day. There’s an enormous amount of information on the site but the discovery day allows you to piece it all together and get some practical boating experience under your belt too. You can find out more about discovery days here. Please note that you need book well in advance of the date you want. You can check availability by clicking on any of the yellow click here to book now links.